Ever since we first started dating, Chris has always worked a bit on the late side. The evenings when he gets home before six are rare and carry the same excitement of an early release day back in grade school. Sometimes this is tough, but I’ve always understood it. When we first met I was acting, and late auditions, all-night shoots, or weekend trips to get my face wrapped in plaster so a disembodied version of my head could be created were part of my norm. Then, during the couple years that I was working at the hedge fund, my nights were often just as late if not later than his. We’re people who work hard and understand that about each other, but we’re also a couple that likes to spend time together. So, without really even thinking about it, we’ve always made it a priority to wait and eat dinner together. We’ve begun starting many of our meals with a small, simple salad. This allows us to mow through the greens first, curbing that initial feeling of desperate voracity. And it’s not painful in the least. We both really enjoy our little pre-dinner salads. In my humble opinion, however, this has much to do with the dressing. Salad dressing can be an issue for the gluten-free. 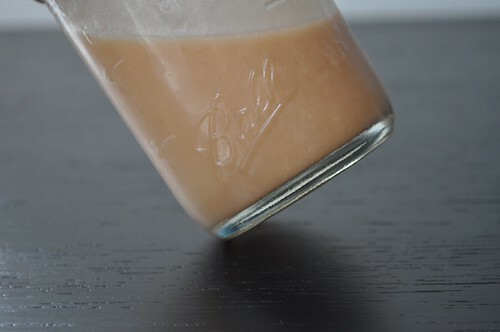 Thickeners and emulsifying agents (and other unpronounceable god-knows-whats) are often dubious or dangerous, and, to be perfectly honest, I just flat out don’t care for many of the bottled salad dressings out there. They leave a strange feeling in my mouth and throat and, if sense-memory serves, even up into my nasal cavity. On top of that, the flavors tend to be muted or artificial. Just not worth it. So I started making my own. This red wine vinaigrette has become our staple salad dressing around here. It has a much higher vinegar to oil ratio (1:1) than most standard vinaigrettes (1:3), which I like because it ups the flavor factor. This means you don’t need to use a lot to get an impact and can avoid adding additional salt to the mix. Also, less oil means lower in fat. Don’t be afraid–red wine vinegar isn’t as pungent as other vinegars and won’t make your tonsils quiver and eyes water as soon as it hits your tongue. What also makes this a staple at our table is that it is ridiculously easy. 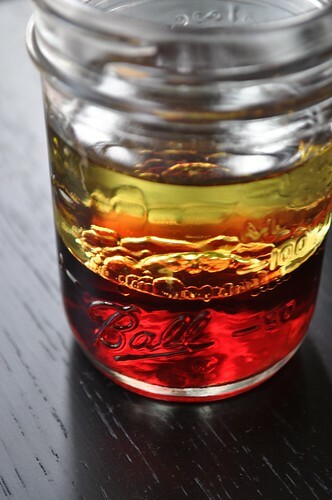 No whisking or slow drizzling of oil–though you can go for it if that’s your thing–just add everything together in a mason jar, lid it tightly, and shake the bejeezus out of it. Or you can shake it really well until everything is a nice, creamy pink color. It’s up to you. If you’re not into canning or don’t own any mason jars, you can just as easily use an old jam or condiment jar. Any jar will work for that matter, as long as you can close it tightly. The only added benefit to using a canning jar is that it offers you a little assistance and spares you the use of measuring cups by being marked along the side. You’ll also notice that I use a nifty plastic lid for my jar, but if you don’t already have these lying around an ordinary two-piece lid will work fine. Add all ingredients to a jar with a lid. Place the lid on the jar tightly and shake vigorously until the vinaigrette is emulsified. 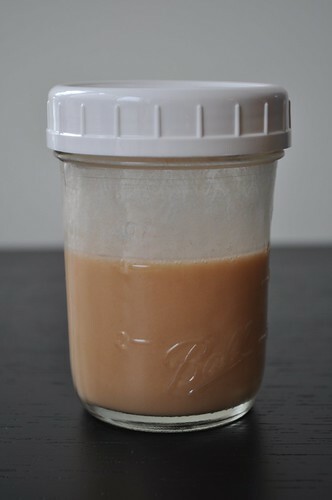 Leftover vinaigrette can be kept in the refrigerator for up to several months.